Are there areas of your home that don’t receive direct sunlight? Are you tired of dark, wet spaces where you can’t comfortably relax? Consider taking control of your light levels by installing one of Patioland’s retractable roof systems. With the flick of a switch you can transform the way you live and revolutionise your functional spaces. Enjoy every part of your home all year ‘round with an opening roof in Sydney. These electric patio awnings are affordable and easy to install, creating the perfect sunroom for Sydney houses. View our gallery for inspiration. Barbecue areas, swimming pools, spas, verandas, patio enclosures and timber decking can all benefit from exceptional retractable roofs. Also, they’re stylish and fun to use so you’ll truly be the envy of your family and friends. By installing an opening roof, you will extend your enjoyment of the outdoors. Experience early mornings, rainy days, winter frost and starry nights in complete comfort. On sunny days, you’ll enjoy ventilated air and protective shade. By simply adjusting the aluminium louvres with a remote, you can let out hot air while allowing cool breezes and ambient light to enter. Protect yourself, your family and your belongings from the wind and unforgiving UV rays, especially in Sydney’s summer. Louvre roofs can be installed in new or old buildings, adding value to homes of all kinds. 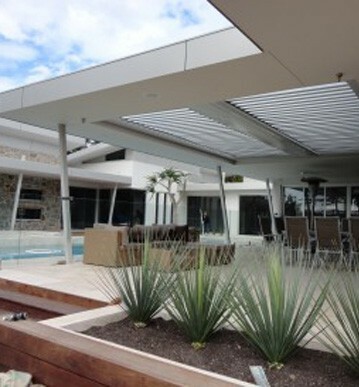 Call 02 9831 3899 or contact us online for a free, no-obligation quote on one of our high-quality retractable roofs.